To WHEAT, partnerships are paramount. We aim to involve partners at all levels in decision making and steering, and your feedback matters. 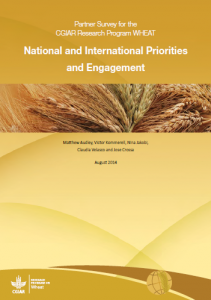 The WHEAT Partner Priority Survey was sent to more than 200 organizations — national agricultural research institutes, universities, private companies, NGOs and international research organizations — in September 2012. The 92 respondents (44 percent of those surveyed) provided information on institutional priorities, engagement and activities in Strategic Initiatives (SIs), as well as priorities for investment in international agricultural R4D and desired outcomes from SIs. So, what do 92 WHEAT partners want from international agricultural research? Partners across most regions and institutions prioritized SI 4 (better wheat varieties) and SI 5 (resistance/tolerance to diseases and pests) for institutional and IAR4D investment. Continued investment in research to combat wheat stem rust disease (under SI 5) is a major priority in all regions. Partners expressed a collective desire for enhanced access to training, information, decision-making tools and breeding material. Regarding “WHEAT measures of success,” respondents placed the greatest importance on meeting growing food demands (food security) and expanding the capacity of agricultural research through greater engagement with all stakeholders. The results highlight opportunities to strengthen and expand the scope of WHEAT, as it transitions through the 2014-2016 extension phase and from SIs to Flagship Projects. Thanks to all those who responded for your valuable input!